I love receiving subscriptions delivered to my doorstep every month filled with fun products, ranging from beauty and lifestyle to food and crafting items. It’s a great way to be introduced to new things I might not otherwise try. Please be advised that some of the links provided are affiliate links and I do receive a small commission if you make a purchase using those links. I very much appreciate your support of this blog in doing so! It’s no secret that I love nail polish. 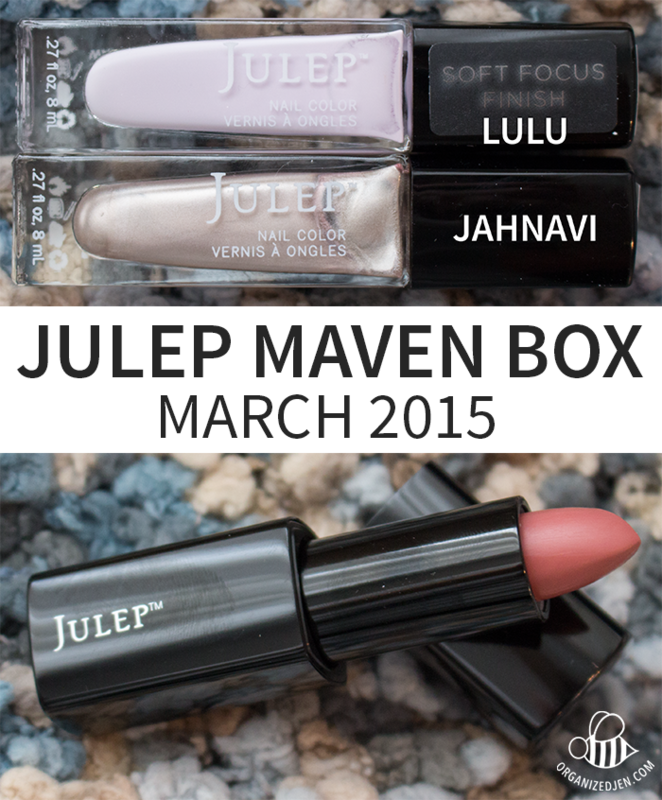 I’ve been a Julep Maven subscriber for a couple of years now and I always look forward to my monthly box from them. The Julep polish formula is one of my all time favorites. The Maven Box costs $24.99 a month, or $19.99 a month with a three-month prepaid subscription. They ship to the United States and Canada only. I love that you can select between several different offerings each month or even skip a month if you’re not feeling it. I received the Classic With A Twist version of the Pop Collection for March which includes two polishes and a lipstick. The two polishes in my box are LuLu, a light pastel purple crème, and Jahnavi, described as an “iced chai chrome.” Both shades are soft and light and feel quite fitting for the transition from winter to spring. The box also came with a Light On Your Lips Full-Coverage Crème Lipstick. I like that I was able to pick my own shade during the Maven selection window offered before the box shipped. I picked Primp, a marsala crème, which is apparently the color of the year. I’ve only just tried this lipstick once, but so far, I really like it. It’s a very “me” kind of shade in a brown-toned pink/neutral tone and the formula feels nice. If you’d like to learn more about the Julep Maven program, I recommend checking out their website. Join now and use code SPRING to receive the four-piece welcome box for free! The Eco Emi Beauty Box includes four to five deluxe or full sized natural and cruelty-free products ranging from bath and body to beauty and cosmetics. It costs $22 per month for US customers, which includes shipping. The box is available internationally for $34 a month. The March box theme is “Spring is in the Air” and comes with three full size beauty products and one deluxe size perfume. The “Always Loved” Perfume by My Daughter Fragrances features Bulgarian rose oil and Turkish rose absolute for that really rosy experience. What a lovely spring fragrance! The Bergamot Orange Sugar Scrub by Grain Bath and Home is densely packed with “organic cane sugar, avocado and grapeseed oils, soothing aloe vera and essential oils of bergamot, orange and grapefruit.” Notably, it contains no nut oils for those with allergies. I always love trying new scrubs and can’t wait to give this citrusy one a go! The Gentle Peptide Cleanser by Jillian Wright Skincare is formulated with anti-inflammatory and anti-oxidant rich botanicals to help “reduce redness triggered by environmental stressors without stripping the skin of it’s natural lipid barrier.” It is unscented, which is a bonus for sensitive types. The Pressed Satin Luxury Eyeshadow by Haughty Cosmetics is designed to be a smooth, long lasting formula that is both paraben and cruelty-free. I received the shade Awe, a pretty champagne shimmer. 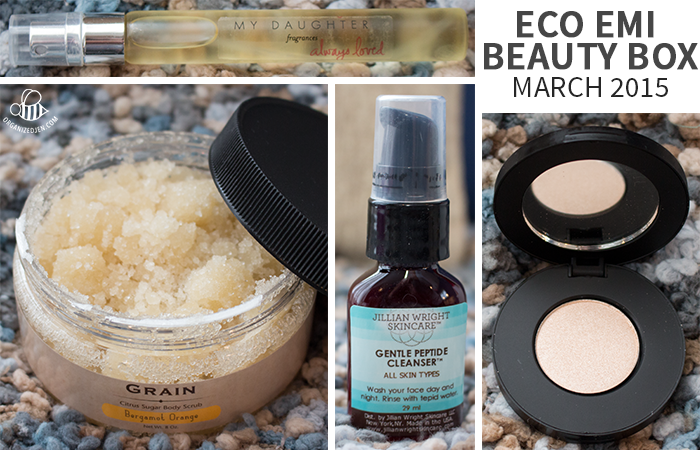 Sadly, the March Box is the last Eco Emi Beauty Box. The subscription line wasn’t as well received as the folks at Eco Emi had hoped, so they had to discontinue it. You can still subscribe to their Monthly Lifestyle Box, which includes seven to eight samples of eco-friendly and all natural products. I absolutely love KnitCrate, which is a monthly (or bi-monthly if that seems like a bit too much yarn coming at you) subscription service geared towards knitters. There are eight different subscription options, which you can see here if you’re interested. The prices range from $23 to $75 a month depending on which kit you choose and where in the world you live (they do ship internationally). I subscribe to the Beginner’s KnitCrate, which includes a pattern suitable to that level, enough yarn to complete that project, a couple of bonus items (ranging from soothing to sweet to fun), and promo codes for knitting related products. It’s basically the most awesome care package a knitter could ever dream of! The yarn included this month is Scrumptious Aran by Fyberspates, a 45% silk and 55% merino blend. It is deliciously soft and the magenta colorway is super vibrant! There are two patterns included this month: Filkens by Jen Arnall-Culliford, a quirky wrap, and the Kenwyn Hat & Cowl by Rachel Coopey. The fun extra is a Baby Baggu Nylon Tote. This little resuable tote is made from ripstop nylon. These are great to have on hand (I always carry a similar kind of bag in my purse). The soothing extra is a packet of Lemon Wafer Bites by Dolcetto Petites. Confession: I ate these as soon as I opened the package. LOL! I couldn’t resist. They were tasty and at only 100 calories a pack they are the kind of little daily treat I could get used to. I see they’re also offered in chocolate and cookies and cream. Sign me up! 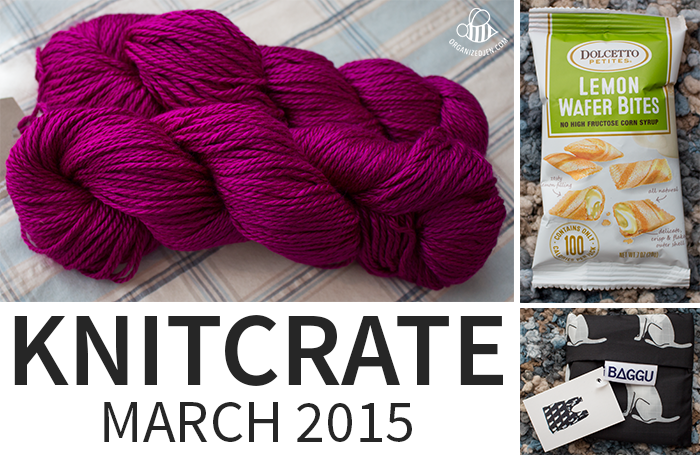 As always, KnitCrate subscribers receive promo codes each month. This month includes discounts on patterns by Melissa Sibley, and yarn from Lydia Yarn as well as Ewetopia Fiber. There’s also a coupon to save on the Digital Tally Ring Counter.. I also subscribe to the 5 Mini Add-Ons package available through KnitCrate. Each month I receive five 30-yard mini hanks in hand painted/indie dyed yarns. It’s a nice way to try out a variety of hand-dyed yarns from different providers. I use the mini hanks I receive through this subscription for my Beekeeper’s Quilt. This month’s selections includes five earthy shades of Kickapoo Sock by Kate Wright Designs. This hand-dyed sock yarn is an 80% superwash merino wool and 20% nylon blend that is snuggly soft in deep colors. I love all of the variety I get with this subscription for my ongoing quilt project! If you’re interested in purchasing the Beekeeper’s Quilt Kit or other items from KnitCrate you can receive 10% off your first KnitCrate purchase (not including monthly or bi monthly subscriptions) by clicking here! This subscription is so much fun! PopSugar Must Have is a monthly subscription service where you receive a selection of full size and premium beauty, fashion, home, and fitness items for $39.95 per month (this includes shipping and is available in the US only). The March box theme is inspired by “Renewal, Citrus, Spring Break, Fresh, and Traveling.” As usual, there is a nice variety of items in this box ranging from beauty to leisure. Most of goodies they included this month are geared towards travel, especially to warm, beachy places. The dayglo pink vinyl Pink Piña Zip Pouch by Samudra, a Popsugar exclusive, is perfect to toss into a beach/pool bag. The What to Pack Pad from Knock Knock is a super cute and helpful list to aid in travel prep. I am particularly excited about the deluxe sample set from Benefit, which includes the POREfessional and Roller Lash Mascara, as I’ve really wanted to try both. Sample sizes like this are perfect for travel as well! I was also happy to see one of my personal favorites, a Wet Brush, in this month’s box. This small version called The Squirt is perfect to keep in my beach/pool bag to deal with tangly hair after taking a dip. The bright yellow color makes it super easy to spot! I’m always interested in trying new skincare products and am very interested to see how I like the Micromagic Microdermabrasion Treatment from Bliss. It gets rave reviews on the Sephora website. You guys know how much I love trying new snacks, and of course, I already ate the Halfpops that came in the box. I had no idea half-popped popcorn could be so tasty! I will definitely be hunting for these in my next shopping trip. The last item is The Archivist Lemon + Cucumber Reed Diffuser Kit from Greenmarket Purveying Co. I set this up in my office bathroom just yesterday and it immediately made my entire office smell divine. It’s got quite the range! The lemon and cucumber scent is a lovely refreshing combination for spring. PopSugar delivered another smashing box, as per usual! I picked up an additional Popsugar Must Have Resort Box as a special gift for one of you! 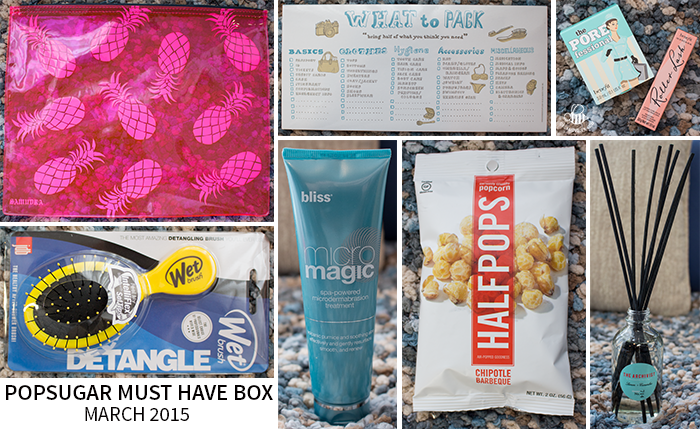 The PopSugar Must Have Resort Box Giveaway will run until Wednesday, April 1, 2015 at 6 PM CT. The giveaway is open internationally. All entrants under the age of 18 must have parental permission to enter. 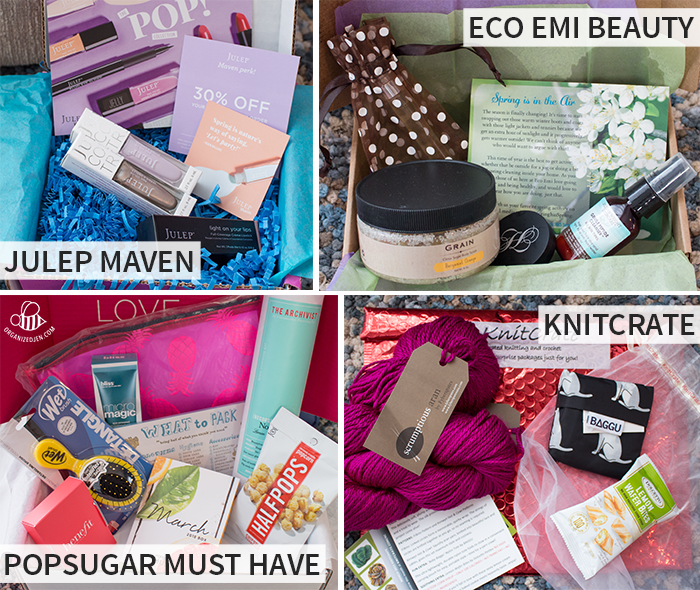 One person will win the PopSugar Must Have Resort Box like the one I showed in the video. You can enter by following the directions in the Rafflecopter widget posted below (check out this blog post for more information on entering Rafflecopter giveaways). I’ll announce the winners on THIS blog post and contact them directly through email, as always. Good luck! I hope you enjoyed seeing what I received with my subscriptions this month. I’d love to know if you receive any monthly subscriptions, too! I’ll be going to Disney World next month for my birthday! ! I’m spending my birthday weekend in New Orleans, family vacation at the beach on the Alabama coas in early June! I love the travel goodies of the PopSugar Must Have Box! Favourite Staycation activities are sleeping in, reading, sport-ing, spa-ing, wine-ing and marathon TV series with mountains of popcorn and ice cream. I am lucky to live by the beach so I am lucky that I get to walk the beach (one of fave things) and get to hunt for seaglass! We’re going to the San Diego Zoo in a few weeks. Off to San Fran with the family for the Maker Fair. Than like you lots of family travel for the summer, and another Disney Cruise probably next winter. Since our Feb trip to Dinsey World and Disney cruise my little family has quite the wanderlust. Luckily hubby is working less, getting ready to retire and our daughter (9) is so easy to travel with. Maybe Europe here shortly? Hmmmmmm planning and skeaming here! Great video and write up. Thank you for sharing. I would love to definitely try Pop Sugar Box one of these days. I have a monthly subscription to Julep and love it (because of you, thank you!!!). I have to say my nails have never looked better! So Thank you! I am turning 50 in two years and my vacation options are Disney World or Ireland. Hmmm! I just don’t know, but I’m hoping we get to do both :). We are going to my family’s lake side cabin in BC Canada. I grew up visiting there every summer, and now bring my children every summer. We so enjoy our time there with family. I’m going to hualalai on the big island for our babymoon next month! Hey Jen – have you ever tried Stitch Fix? 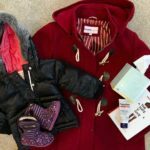 Not quite a subscription box – but a personal shopper will send you a box of clothing/accessories once a month (or at frequency you want). You keep what you like, send back the rest. It’s fantastic and turns you on to some new/different clothing than you might typically shop for on your own. Highly recommend! I won’t be traveling this summer because I will be welcoming my first niece into the family! I’m going on my honeymoon!! We’re going to a sandals resort in the Caribbean! I am heading over to St. Pete Beach Fl in late Spring to volunteer at an amazing woman’s retreat. The Loews Hotel there – the Pink Palace is amazing! The beach area is so beautiful! Can’t wait. We will be having a bridal shower for my daughter and college hopping for my son! I’ll still need to pack and would LOVE this box! I’d love to go on a curise. Thanks for a chance to win. Our spring trip came a little early so we could have both our children with us. (two different colleges). We went to Florida for 3 days with just my husband and I. We then picked up my childhood friend who lives in Florida and our son at college. My daughter met up with us the next day and we did 5 days at Universal. Must admit I missed my Disney fix, but being with family is the true goal. We plan on going somewhere when the kids get for spring break at the end of the month, but we still haven’t decided where! Hopefully we get it figured out before then! Another amazing box! Thanks for the giveaway! We will be leaving for Puerto Rico for our Spring vacation in a few weeks. So excited to visit a new place and learn about the historical city of San Juan! Really curious to find out where you’ll be going for your anniversary vacation. I love to travel just as much as I love to organize! I would love to go away this Spring but we’re getting ready to move house! We’re hopefully heading to Lyon, France in June though for a long weekend. I’ll be going to San Francisco for 10 days in the beginning of May together with my mother. We are going to visit my brother and his wife who live there since last year (I’m from the Netherlands)! I’m really looking forward to it!! Heading to our condo in Palm Springs. But I want to win the box for my daughter who is a wedding videographer (Hoo Films) and travels the world! Thanks for a great Christmas idea for her! For our staycations, we like to try to do something a tourist would do in our town, so that we can check things out for when we have visitors- we just scheduled a trolley tour that is new- I know the spots they go to, but it still seemed like a fun thing to try out. (Live in San Diego) I like to schedule a long weekend with a spa appointment, a restaurant we haven’t been to and time to read/ relax. I find there are a lot of things that are happening that we take for granted living in a place that are fun for locals too. I visit the Minneapolis area often/lived there a long time and have never been to the state capitol- I am going to try to do that this spring on a family visit. I’m going to Disney for spring break. Can’t wait! We’re planning two weeks in Scotland this year. Also, we spend quite a bit of time at our vacation (beach) home. We’ve also got a long weekend planned in Chicago this summer. We don’t have any big trips planned this year but we do live an hour from Yellowstone National Park. We make several trips during the summer to look at the wildlife. Will be going to Siargao Island in the Philippines! We are driving the Pennsylvania to see my cousin pitch a baseball game for his college on Good Friday. Then we are spending Easter with his family!! We are going to to Disney World at the beginning of April for Spring Break and to celebrate my daughter graduating from High School. We are going to Disney World with our family !! i’m in The Netherlands and I’m going on vacation to a part of The Netherlands called Betuwe. Love traveling with my family seeing new things! If we don’t travel, we garden, read, play, and eat close to home. Either way – fun! All of your PopSugar videos and openboxes have me excited to the point that i finally caved – signed up for my first box today! I’m headed to Orlando in a couple of weeks (for work, and maybe a little fun!) – can’t wait for both! We are going Spring Break Camping! We will be doing a “staycation” at our cabin which is always so fun! Yes, I’m going away in 4 weeks, can’t wait. We’re going to Mallorca, a Spanish island (I’m from the UK). I’ve been watching your packing videos to get some tips! We are planning on going to the new museum that will be opening up here locally. did you announce the winner for the Pop Sugar Target must have giveaway? Yes, that winner was contacted and the prize was sent out. Heading to Sea World next week with the family. I’m not going abroad, but to a different city to visit my family 🙂 p.s The train case is so beautiful – love the lining! I’ll be heading up to Grayling, Michigan in about one month. From there we visit the Amish and Mennonites over in Mio, Michigan. Lots of fun!!! We have a vacation home in Surfside Beach SC so I will be traveling there many times this summer. Thank you for your excellent blog and youtube channel – you are one of my very favorites!!!! I will be going to Puerto Rico with my group of friends for much needed fun and relaxation! Just a staycation this spring. Maybe we’ll go to downtown Chicago and walk around if the weather is nice. We’re hanging at home. Hoping to enjoy some days at the park, providing the weather cooperates. We go up to our condo in late spring and this year will be very interesting as we just got a 14 yr old kitty cat as our new pet. The vet says he’s ok for 5 hours in the car, so here’s hoping he doesn’t meow the whole time! We also hope to visit our daughter in New York City for a few days in early June. What a fun box! Thanks for the chance to win. I’m waiting until May to travel to Arizona to enjoy the sunshine with my daughter at a luxurious resort/spa. My husband and I are sailing to the Virgin Islands on our boat leaving from Corpus this summer. I am taking my son to Hawaii to celebrate his high school graduation. We are headed to Folly Beach, SC next week! Spring break is next week, and we are just going to head to the Zoo, and do a few indoor museums! We went to Disney in October! We took an early Spring break this year! Just a staycation!!! I love your videos. Thank you for sharing your happy boxes with us. I just love seeing all the fun items. We’re flying over a university my oldest son will be attending (sob – i’ll miss him when he leaves this fall but SO happy for him as well). We’ll make time to explore in between meetings and tours. This Spring I’m hoping to bring my kids up to DC to see the museums and monuments. I moved to MD at the end of Jan, and my kids stayed in VA with their father. I really miss them and really hope they’ll enjoy spending some time with me! We are not going anywhere till the summer which will include a trip to the beach in Alabama, and my hometown in South Florida to visit family. I will be spending my Spring Break traveling to my daughter’s basketball tournament for AllStars!!! I am going on a trip in April! I live in Vermont and my boyfriend lives in Wisconsin, so I get to visit him, yay! I haven’t seen him since Christmas. My staycations include cross stitch, reading as many books as possible and going to the cinema… as well as fantasizing about a vacation. We will be doing small day trips! I am going to Honolulu to see family! Aloha! I am headed to Denver CO, in late spring! I am going to Myrtle Beach! Were going to Orlando for vacation next month. No plans to travel yet. We might go visit our son, who is in the Army. We are staying home for spring vacation to save up for our visit to the House of Mouse in July! We will probably, run to the movies & a couple of museums with the kiddos during the break to keep us entertained. I’m moving out of state with my family so in a couple weeks we’ll be making a road trip to our new home. I live in Sunny Southern California so I plan on taking the kids to the beach. I’m going to Disney World for our honeymoon. Yes, we are going to a small beach town for a quiet and relaxing week! I am so blessed to be able to visit some gorgeous places in Italy this year! Jen, you’re great! I love staying and reading. We’ll be going to a nearby city to spend a few days. Will enjoy a dinner theater which is such fun! Thanks for sharing. Staying home to watch my kiddos play spring sports !! Im not going on a trip I would love to go relax with my husband and our three girls lay on the sand get in the water just spend time with my love ones but its hard for us because im sickly an with me having to get treatment an just never knowing when I’m going to have a rough day that makes it hard for us to travel but at the end of every day good or bad I have my family and that is what keeps me going . I’ll be going to Napa with the hubby! No spring vacation. We were just in Disney for a week and ran in the Princess 5k. Going to Napa Valley for a week long jazz concert. we will be heading north to cooler weather since ifs already hot here! We are just staying home this spring and enjoying the weather and spending time with family. Hi! this is my first time commenting, (my english is not very good) we’re staying at home, we already live in a beach town in mexico so lots of driving to the beach, or just by the pool. Hi Jen! 🙂 I’m going to San Miguel de Allende with my family, is really close to where we live! Hello~ we live in So Cal, so we are so blessed to live and enjoy the beaches, but we are planning to hit the road and visit several National parks. and some ghost towns. Everyone enjoy there “in’ town and “out” of town vacations!!!!! Heading to DC for the Cherry Blossom Festival! I’m going to my boyfriends family’s vacation home with the entire family during easter 🙂 – Thank you for sharing. I am going on a cruise of the med this spring with my boyfriend, my parents and my sister and her husband.. we all live apart so we are really looking forward to this family holiday. cannot wait! I m not travelling away this spring,but i love to! I love the Knitting box, would love to have it at home …so I can knit when I m sad and alone. I really enjoyed to watch the video,I love the PopSugar Must Have Resort Box ,fantastic to discover what s inside! I will be going on a babymoon/sibling graduation in May to Minnesota. We will be going a few days before the graduation to visit Mall of America for the first time. Then seeing baby sister graduate from college. It will be a short laid back trip but I’m still looking forward to our last out of town trip before baby arrives in July. I will be going to Price Edward Island. Taking the family across the bridge then taking the ferry home. Such a beautiful giveaway. Ty for the opportunity. Not sure of any plans as of yet, but my favorite staycations include relaxing with a good book or magazine, going to movies, doing some crafting and just taking some time to breathe! Am going to York in England. A short flight for me this time since I leave in Norway. Last year Iwent to North Carolina and Texas, A looong flight. I get to go to both vegas and florida this spring 🙂 excited to get out of cold weather (MN). I am not sure I’ll be able to take a trip anytime soon. If I was able to, I would love to visit my friend Laura in Charleston! Hi Jen! My husband and I will most likely not be traveling this spring, but sometime this late summer or early autumn, we will be traveling to Egypt for my sister-in-law’s wedding. I’m leaving in 3 weeks to spend 10 days on a culinary tour of Tuscany! You have so many close friends here. It shows that you have much joy and love for them. Jen, I know you have a gazillion subscribers and a request from one may not be possible, but… if you could let me know what you think of the scrub, I would love to know because it sounds right up my alley, also the Gentle Peptide Cleanser, both from the Eco Emi beauty box (sorry to see it go) — haven’t been able to subscribe for personal reasons, but those are both items I could use — sensitive skin/older skin/rosacea and I’d love if you could let me know! Thanks, love your videos — all of them! Headed to BlueRidge to run a marathon with great friends! Fun for all! My family is kind of splitting up for trips this spring! My husband and I are taking a 5 day getaway to Montego Bay, then we will return for a few days and take a trip to Minnesota with our daughter (she’s visiting the Mayo Clinic and we’re making a mini vacation out of it-Mall of America!! ), then our son heads off to study abroad and travel Europe for a few months. Busy busy! I am going to visit my parents at the beach in Georgia during my spring break. I teach high school and love getting to go on a trip just like my students do. Me my hubby and new baby boy will be going to Devon (England) this spring. It will be our first family holiday. Can’t wait! I am going to Disney World at the end of April for my daughter’s cheer competition! Staying a few extra days to enjoy the parks!! we’re staying put for the time being. my favourite staycation activities include lots of movie watching and catching up on series, book reading and doing some crafty projects. Heading to my sister’s lake house for some relaxation! My family will be taking multiple trips up to the cabin this summer. Our twins will be 1 in July and our oldest will be 4 in October. I cannot wait for this summer, and being able to watch the kids play and have fun. My fiance and I are heading to Disney World together for the first time! This will be my 16th trip and his first; we are so excited! Thanks for the giveaway! I like to watch a lot of movies and go on local trips to the lake or river to get outdoors! Hi Jen, thanks for sharing. What a nice box, i will be traveling to Cuba to visit my family. It will be a great gift to share with my people there too…its all about tbe family and giving to the less fortunate. My husband and I are going to Austin, Texas for a wedding in April. We plan to take a small trip sometime in May but we haven’t decided where yet. We are also taking a trip in the fall to Disney World for Food & Wine Fest. We’ve never been to Food & Wine Fest so I’m very much looking forward to it. Hope you have safe travels this year! Thanks for sharing all your subscriptions with us. Have a fabulous weekend! My family will be going to Cancun, Mexico in May. Then in June I am going to visit my family in Poland for 2 months. So excited!!! Spring Travel is the best! 2 of my girlfriends and I are going to DC to enjoy the Smithsonian again as adults. We’re also hoping to see a show at the Kennedy Centre and obviously go to the Capital Grille The Lobster Mac and Cheese is DECADENT! I will be going on my first ever cruise the end of April.. Sailing to the Western Caribbean.. I am out of this world excited!! My dream is to visit the Cayman Islands and the day we pull into port .. it’s my bday.. Like a match made in heaven!! birthday gift I know she will enjoy. Nappa is so pretty in the springtime. I guess you could say I am going on a trip…. I am moving across the country this spring!!! My “Staycation” is usually not planned at all. I like to “go with the flow” and not have to think things ahead. In any case I usually do a bit of shopping and go out with my friends. Of course, being a university student, I only plan out my studying schedule (if I need one), complete projects or read for school. I will be visiting my parents who retired to Orlando Florida. I don’t have plans to go yet. But I would love to move to an apartment on my own soon and I already have in mind how to decorate it. I am busy organizing and purging my stuff this spring. We are headed to Las Vegas for our 333 1/3 anniversary. In addition to the usual LV things we plan to do some Power Geocaching. You can follow us at geocaching.com we are Team_CSG. For Colorado State Geocaching. Later this Spring, after mud season we are headed to the mountains for a long weekend at a great resort. I’m headed to San Diego for a business trip, but I’m flying in early and staying after business is finished to do some fun activities including Sea World and the San Diego Zoo. San Diego is one of my favorite places and I’m looking forward to a little R&R after a stressful few months! Just some short trips close to home for now. I am going to Cancun and Scottsdale, Ar. this summer. Really excited. I’m planing on going to a short trip. We are not 100% sett on where we want to go, but Bulgaria is in first place at the moment. If ever come to Norway we have a nice little cabin you could check out. Travelling is physically difficult right now but I make the most of staycations by bringing the gbabies into my studio for some art time and walking to the park for playtime and then back for snack time!!!! I did a staycation in my town. Went to free museums and toured the state capitol and library with my daughter. My “Stayvaction” is normally spring clean the whole house, catch up on craft projects With my daughter. Most evenings we have family/friends night -movie, board games, singstar-karoke, daughter & her friends will do a talent show night, quizzes which are always FUN. I’m going to New York with my family including my 7 year old great niece! Not going anywhere this Spring, but HOPEFULLY Disneyland in the Fall (October-ish) : ) Enjoy your 10th Anniversary trip, wherever you decide to go! We have a trip planned to Chicago in early May. Our daughter, who is an art major, has never been to Chicago and is excited about seeing the art museums. Looking forward to seeing some theater and shopping!! We’ll be going to the North Georgia mountains in a couple of weeks. I’ll be playing with my nephew and studying for my finals!!! We’re going to the mountains in June! We’re just headed up the coast to Santa Cruz for my fiance’s school’s alumni gathering. We’re staying for a long weekend, though (5 days) and I haven’t actually stayed in Santa Cruz before, so it will be nice to explore his old haunting grounds from long before we ever met. Technically it’s Summer, not Spring, but I’m going to Italy for 9 days! I’m super excited. I will be going to San Francisco! It is one of my favorite cities! I’m not going on any trips that I know of as of yet this year but, I do have a lot of back yard parties with family and friends and enjoy day trips to the beach or parks or nearby tourist destinations since I’m surrounded by them. I hope you enjoyed your products! We are headed off to spend the entire month of May at the beach then we have a cruise planned for the end of July and two weeks at Walt Disney World !! So excited for travel this spring and summer! We will be staying close to home but will take a couple long weekends to amusement parks and also water parks! I will be going to Hawaii in two weeks! I’m so excited I can’t wait! I’ve never been to Hawaii!